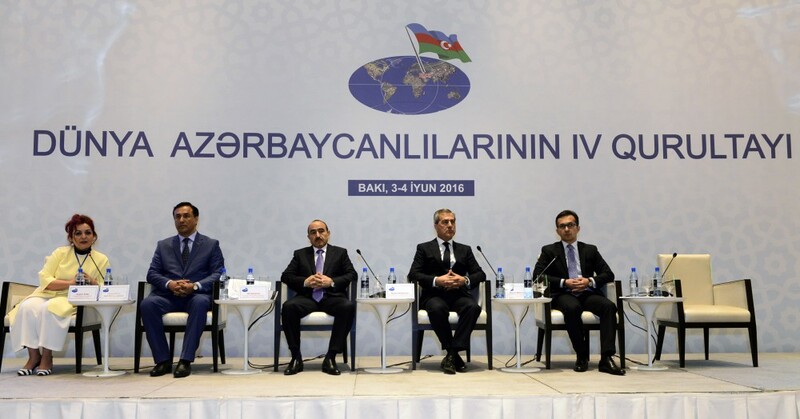 A final meeting of the fourth Congress of World Azerbaijanis has been held, Azertac reported. Addressing the event, Chairman of the State Committee for Work with Diaspora Nazim Ibrahimov said that the two-day congress featured fruitful discussions and heard interesting ideas. Hailing the Azerbaijani President's speech at the opening ceremony, the committee chairman noted that this was “keynote instructions for the future activities of diaspora organizations”. Other speakers noted that the congress provided a good platform for the Azerbaijanis living in different countries across the world to work more actively for Azerbaijan, to combine efforts and to further strengthen coordination. Hailing the importance of the congress, the Azerbaijani President`s Assistant for Public and Political Affairs Ali Hasanov highlighted the history of the idea of unity of world Azerbaijanis. Saying President Ilham Aliyev signed 17 decrees relating to unity of world Azerbaijanis and the expansion of the activities of their organizations, the Presidential Assistant noted that world Azerbaijanis` coming together was of pivotal importance in terms of their committment to their homeland and strengthening unity among them. Ali Hasanov underlined that world Azerbaijanis should be active and set example in social and political life of the countries where they reside and also integrate into the societies of these countries. He hailed the significance of unity of Azerbaijanis around the world. "This is of crucial importance in terms of the protection, strengthening and development of the idea of Azerbaijanism," he added. The participants adopted final documents of the congress, and approved the new Coordinating Council of World Azerbaijanis. They unanimously re-elected President Ilham Aliyev as chairman of the Coordinating Council.